PDXSol is an organization truly comprised of equal members. no one individual or organization is over or controls pdxsol. We do not operate on the corporate model, preferring a more horizontal approach. 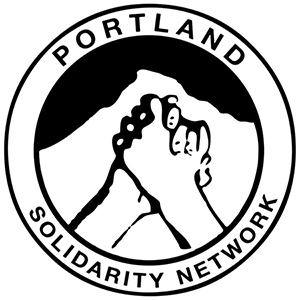 all solidarity networks are operated separately and are able to function and act in the way that works best for the needs of their members and community. there are no bosses, no leaders, no hierarchies. 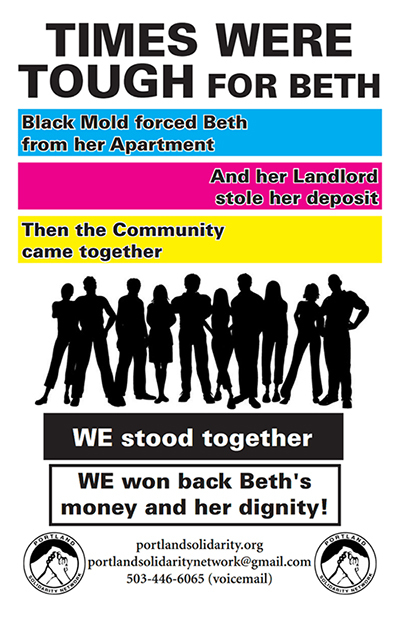 the only leader is the member of the community that we come together to support during a campaign. we do not act on behalf of others. 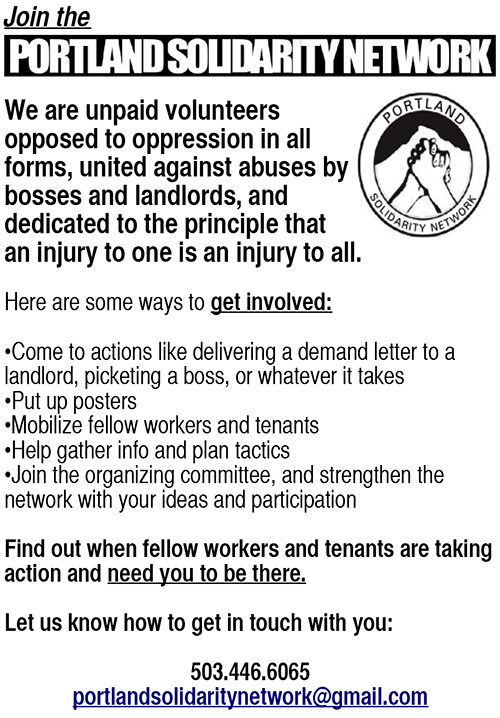 we amplify the voices of people fighting for fairness and lend strength to the powerless through solidarity. Miranda was in a terrible situation with a slumlord whose refusal to make necessary repairs caused her to unnecessarily pay greatly increased utility costs while allowing her very limited use of hot water in her home. malfunctioning fixtures that were never repaired led to a complete inability to use them at all. after three years of continued refusal to address this worsening situation, she confronted him and recorded that confrontation. He responded with a text message saying that she would be evicted, contrary to local tenant laws. miranda complied, even moving out before the 30 day deadline but the property manager refused to perform the walkthrough when requested (see below). he then refused to return her deposit and demanded a further $700 for unproven damages. many slumlords take advantage of the fact that the people who live in low income housing cannot afford legal representation and have little to no recourse in the face of this type of injustice. In the above video, we see miranda leading the campaign. her mother delivered the demand letter, reading it through the door that the property manager refused to open. miranda could not do this herself because the property manager had called the police and she was not allowed on the property. 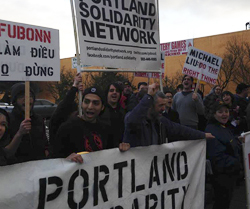 after the demand delivery, pdxsol members began an escalating campaign in earnest, leading to an eventual agreement with the property management company which led to miranda receiving the money she was owed. for more information and details, plus pictures, go here. When you work for a living, every dollar counts. 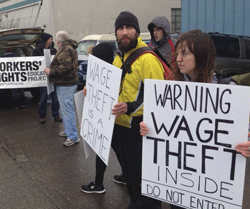 Breaks denied, unpaid overtime, tips withheld, illegal deductions – this is wage theft! ARE YOU NOT PAID FOR ALL THE HOURS YOU WORK? ARE YOU REQUIRED TO SKIP OR SHORTEN YOUR 10-MINUTE BREAK? ARE YOU FORCED TO INTERRUPT YOUR 30-MINUTE LUNCH TO WORK? DO YOU NEED TO STAY AT WORK LONGER THAN THE HOURS SCHEDULED & NOT PAID TO FINISH YOUR TASK? ARE YOU WORKING OFF THE CLOCK BEFORE OR AFTER YOUR SHIFT? HAS YOUR BOSS KEPT YOUR TIPS? 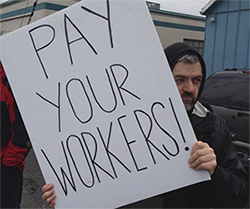 YOU CAN FIGHT WAGE THEFT TO WIN THE MONEY AND THE RESPECT THAT YOU ARE DUE!